Citation Information: J Clin Invest. 2012;122(8):2827-2836. https://doi.org/10.1172/JCI62374. The DNA damage response (DDR) is a complex regulatory network that is critical for maintaining genome integrity. Posttranslational modifications are widely used to ensure strict spatiotemporal control of signal flow, but how the DDR responds to environmental cues, such as changes in ambient oxygen tension, remains poorly understood. We found that an essential component of the ATR/CHK1 signaling pathway, the human homolog of the Caenorhabditis elegans biological clock protein CLK-2 (HCLK2), associated with and was hydroxylated by prolyl hydroxylase domain protein 3 (PHD3). HCLK2 hydroxylation was necessary for its interaction with ATR and the subsequent activation of ATR/CHK1/p53. Inhibiting PHD3, either with the pan-hydroxylase inhibitor dimethyloxaloylglycine (DMOG) or through hypoxia, prevented activation of the ATR/CHK1/p53 pathway and decreased apoptosis induced by DNA damage. Consistent with these observations, we found that mice lacking PHD3 were resistant to the effects of ionizing radiation and had decreased thymic apoptosis, a biomarker of genomic integrity. Our identification of HCLK2 as a substrate of PHD3 reveals the mechanism through which hypoxia inhibits the DDR, suggesting hydroxylation of HCLK2 is a potential therapeutic target for regulating the ATR/CHK1/p53 pathway. (A) Flag-PHD3 immunoprecipitated from HeLa cells was separated by SDS-PAGE and stained with Coomassie blue. Protein identities were confirmed with MALDI/TOF/TOF. (B) HeLa cells transfected with Flag–PHD1–PHD3 or empty vector were harvested after treatment with DMOG or PBS for 4 hours. Immunoprecipitation with anti-Flag beads was followed by Western blot analysis with the indicated antibodies. 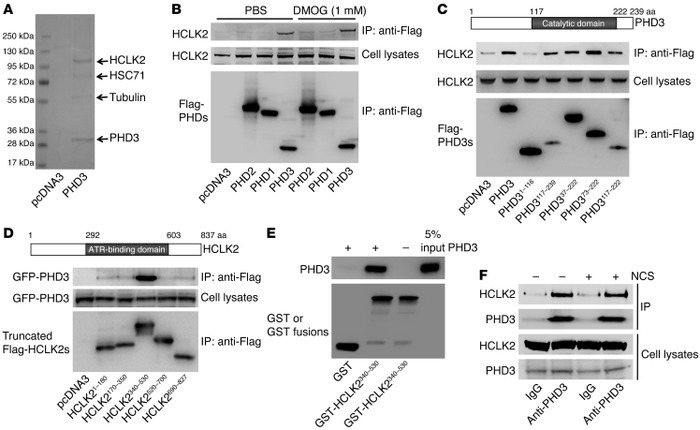 (C) Truncated Flag-PHD3s or (D) truncated Flag-HCLK2s and GFP-PHD3 were transfected into HeLa cells. Cell lysates were immunoprecipitated with anti-Flag beads, and Western blot analysis was performed with the indicated antibodies. (E) GST or GST-HCLK2340–530 fusion proteins (1 μg) were incubated with an equal amount of recombinant PHD3 prior to GST pull down. Pull-down product and 5% of PHD3 input were separated with SDS-PAGE and analyzed by Western blot with anti-PHD3 or anti-GST antibodies. (F) Endogenous PHD3 was immunoprecipitated with an anti-PHD3 antibody. Immunoprecipitates were analyzed by Western blot with anti-PHD3 or HCLK2 antibodies. Representative blots from at least 3 experiments are shown in B–D.